A search for the family of the man he murdered! During World War II, Keith Masters, an infantry officer, engages four Japanese in a cave on Iwo Jima, killing three outright. The fourth, a sergeant, is mortally wounded, but is finished off by one of Masters’ men. 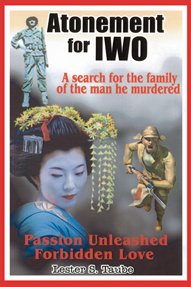 Twenty years later, Masters, a bitter failure with work and family, suffers a heart attack, and develops the fixation that his misfortunes are due to being responsible for what he concludes is the murder of the Japanese sergeant. He goes to Japan to seek the family of the dead man, to help in some small way to overcome their loss. There, he becomes involved with the sergeant’s wife, Kimiko, a former prostitute, who, to his surprise, has become one of the wealthiest women in the country. Her beautiful, modern minded daughter, Hiroko, offers herself to keep Masters away from her mother. Worst of all, Kimiko’s son, Ichiro, is awaiting execution for the assassination of a politician. Now Masters has an opportunity to atone for his sin.